Mad doesn’t even come close. Feel the fury of the merciless car chases. The Road Warrior is back. But badder and better? In a stark desert landscape where humanity is broken, two rebels just might be able to restore order: Max (Tom Hardy), a man of action and of few words, and Furiosa (Charlize Theron), a woman of action who is looking to make it back to her childhood homeland. 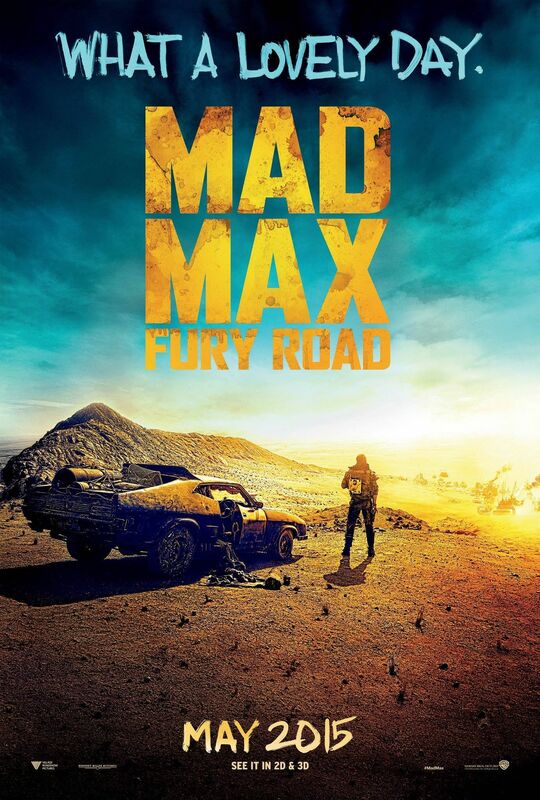 George Miller brings his Road Warrior to the 21st Century. Rebooted, rejuvenated and relentless. Hardy was the perfect choice. On paper. I felt his performance was a little shaky. His interpretation was a little disjointed. I’m not sure whether it was down to Miller’s direction or what? Hardy seemed too mechanical. He barely said a word. Which wasn’t a problem but when he spoke, it was drivel. I preferred Mel Gibson. He may have played the mystery man but he did have some charm and charisma. John Seale’s cinematography was something else. Absolutely breathtaking. He really brought Miller’s dream apocalypse to life. Miller made full use of that mega million budget to make his future apocalyptic wasteland. It’s great watching the original Mad Max trilogy before hand. Fans will know that it was all building up to this. I was still debating whether it was a reboot or a sequel. If you are unfamiliar with the original films then it isn’t essential at all. But for MM fans, the car was there? So was it a reboot? The voices and the vision of the child asking Max to save them felt like a reference to the trilogy? So a sequel? Either way, not a MUST! The set pieces were intense. I was impressed by what Miller had done with the original trilogy. Proper cars, proper chases. For the majority of the action, it was still in that vein BUT on a biblical scale. However, as with all blockbusters CGI inevitably makes an appearance. I only saw this in 2D. You could tell what bits would have been in 3D and to be honest, I’m a little miffed that I missed my chance. BUT it also made everything look way too cartoony. The CGI in the sandstorm sequence was too much and killed the intensity of the chase. It was worse than the dated props and dummies of the 80s. The Mad Max franchise may have been starting to show its age and what do you expect after 30 years?! It was always strange. I loved the nihilistic undertones. Dark, brooding, haunting with the right level of silliness. Miller just cranks it up to 11 and revs the engines for sheer balls craziness. From the off, it’s fast, frantic and violent. I was hooked. Merely because it doesn’t give you a chance to take in all the quick-cut editing and sweeping shots. Hugh Keays-Byrne was brilliant as the demented Immortan Joe. The patriarchal leader that rules all. Controlling the water supply. Turning it on at small intervals to watch the slaves fight for thirst. And of course, in typical Mad Max fashion, he sends tankards out on quests to seek . . . that most precious of substances, gasoline! Nicholas Hoult was superb as Nux. The ailing obedient servant hell bent on earning Immortan Joe’s respect. He really has excelled from About A Boy and Skins. Delivering another scene stealing performance. There were a couple of angles that did intrigue me. The idea that this strange colony abduct people from the road and use them as blood bags was messed up. The weird mythology that Immortan Joe enforced about Valhalla was laughable. I know the film has sparked debates with its feminist context. I merely review films but the idea of women against the patriarchy certainly made this installment stand out a little more. And let’s be honest Mad Max fans, it had been heading that way. Let’s not forget Tina Turner’s surprising turn in Mad Max: Beyond The Thunderdome and maybe forget the Hook Neverland kids vibe in the last part. If anyone could play a strong female defying the odds and breaking free, I couldn’t think of anybody better than Charlize Theron. She was very good as Furiosa. Immortan Joe’s most valued servant. Or so he thought. My main issue was that the supporting ladies had such unmemorable characters. Zoe Kravitz was very weak. I think the only one that stood out was Rosie Huntington-Whitely (No, not because she’s the model. Although . . . NO! Focus) BUT because she was the only one who had a teeny tiny piece of back story to support the rather weak story line. There were a few twists along the way. Miller may have lost it with the OTT demented silliness BUT he still wasn’t afraid to shake things up when the pace seemed to lumber. And unfortunately, it did in parts. 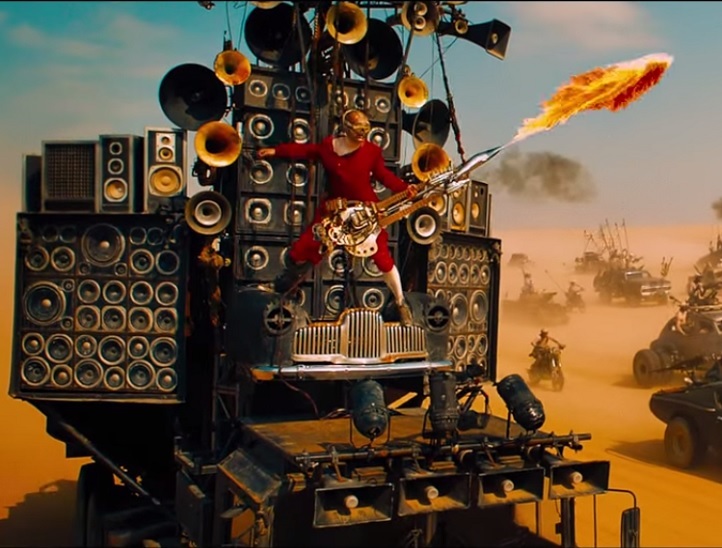 For MM fans, I felt that Fury Road was a revamped Mad Max 2. One of the best installments in my opinion. Immortan Joe felt like he had been torn from the same cloth of Lord Humungus. He even had a stupid and memorable mask as well! The musical score by Junkie XL was incredible. I don’t normally commend movie soundtracks but it really made the chases that much more dramatic and engaging. Exhilarating and frantic. Very much like the movie. I just wish there were more memorable supporting characters. The endless visions, hallucinations and flashbacks that Max experienced were really annoying. The more they popped up with that annoying kid, the more I could feel my patience wading. Max only really got to shine in the last 20 minutes. I’m sure that was the point but Max was always the one you were routing for. The underdog. This time, you have Furiosa. Max just seemed so bland. He got lost in the mix. BUT how could he not with this demented wasteland? Mad. Not at all. I was hooked. The action was intense. BUT Miller could tone down the craziness and crank up some plot and characters for the next post-apocalyptic western. Maybe.